Good ole mates Tony and Ian have been doing things on the side of their day jobs in BLACK SABBATH and DEEP PURPLE before. Once in a blue moon (1983 approximately) they even hooked up in SABBATH to conceive “Born Again”, to alarming reactions. Long after that incarnation they joined forces again in Rock Aid Armenia, which brought much better headlines. Later years saw them doing some studio sessions and started a rumor, which ended up as the WHOCARES. The project involved bass player Jason Newstedt, guitarist Linde Lindström of HIM, the late great Jon Lord and drummer Nicko McBrain. The project amounted to a couple of official tracks, but the duo has decided on a double album to help build a school in Armenia. The two discs are filled with mostly rare and new tracks, and two for pure pleasure I believe. The tracks for pure pleasure are no fillers, neither “Zero the Hero” nor “Anno Mundi” are amongst the bands weaker moments, on the contrary they deserve more recognition in the BLACK SABBATH back catalogue. Super group WHOCARES contribute their back catalogue, both tracks are more or less oriental in style and in the case of “Out of My Mind” I wish DEEP PURPLE would record something as good these days. Ian has contributed the lion part of the songs, everything from a special track featuring a Greek vocalist to the rock´n´roll track “Can´t Believe You Wanna Leave Me”, via his ploy band GARTH ROCKETT and the MOONSHINERS to the utter rubbishof “Can I Get a Whitness”. Tony has been more careful I believe, releasing some numbers with GLENN HUGHES on vocals, apart from the aforementioned SABBATH tracks. I still think the most feelings was evoked by the rendition of “Smoke On the Water” featuring RONNIE JAMES DIO (R.I.P). Imagine such a small man filling out just about every track he had a go at! But still this album is not flawless, still I wish them luck in rebuilding the hopes of Armenia. 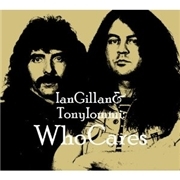 WhoCares "Out of My Mind"
Black Sabbath "Zero the Hero"
Ian Gillan Featuring Iommi, Ian Paice and Roger Glover "Trashed"
M Ratzinkis Featring Ian Gillan: "Get Away"
Tony Iommi featuring Glenn Hughes "Slip Away"
Gillan "Don´t Hold Me back"
Ian Gillan "She Thinks It´s a Crime"
Repo Depo Featuring Ian Gillan "Easy Come, Easy Go"
Deep Purple Featuring Ronnie James Dio "Smoke on the Water"
Tony Iommi Featuring Glenn Hughes "Let It Down Easy"
Ian Gillan "Hole in My Vest"
Gillan & Glover Featuring Dr John "Can´t Believe You Wanna Leave Me"
Ian Gillan & the Javelins "Can I Get a Witness"
Garth Rockett & The Moonshiners aka IG "No Laughing in Heaven"